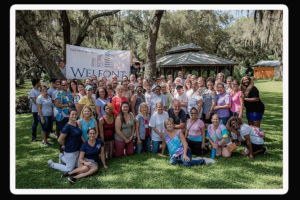 Words cannot express my deep gratitude to each and every one of you that helped support, plan, shop, move and work the 2018 Santa’s Workshop Weekend sponsored by Tampa Carrollwood Rotary and our sustaining sponsors Welfont and 1Voice Foundation. Each year I think we can’t outdo the previous year but with your help we do, because of you. Pam Knowles, Camp Photographer has posted hundreds of photos on her site. 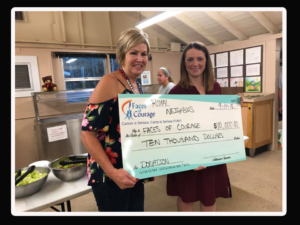 We are thrilled to announce that Amy Jones and Darcy Smith from Royal Neighbors Insurance Company visited camp this past weekend and presented Peggie D. Sherry, CEO/Founder of Faces of Courage with their Nation of Neighbors Grant of $10,000. to fund the 2019 Teen Cancer Camp. We are over the moon thrilled to be recognized by this 125 year old company that was founded by a group of women before they had a right to vote! Special shout out to Jane Morse-Swett, President/Founder of Women with Purpose for nominating Peggie for this prestigious award. Pam is graciously allowing everyone to be able to download their photos at no cost, by right clicking on the images and saving them to your computer. 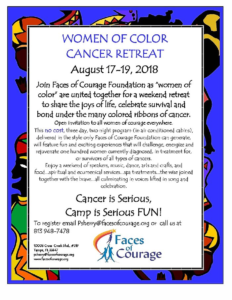 Registration for the 2018 Women of Color Cancer Camp is now open.